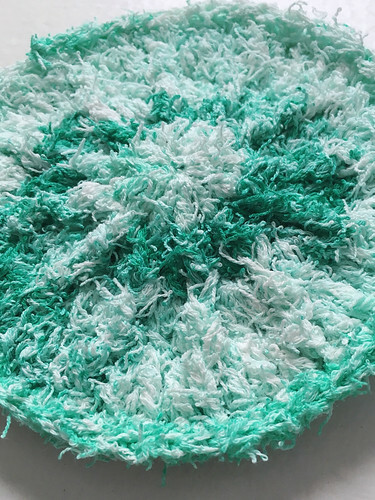 I found this pretty and funky yarn in Hobby Lobby, Yarn Bee's Scrub-ology cotton, so naturally I had to get it and make something "scrubby." 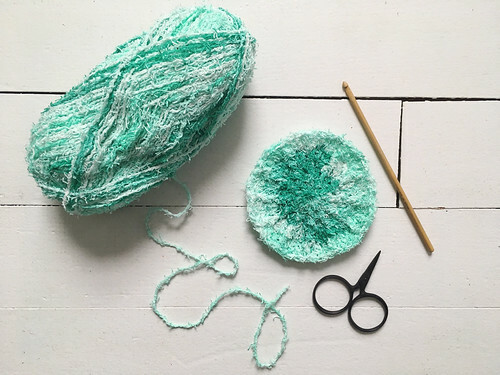 So today I'm sharing a little round dish scrubby with you, and I'm also going to leave you with the pattern if you'd like to make one too. I haven't given out a pattern in awhile, so it's long overdue. 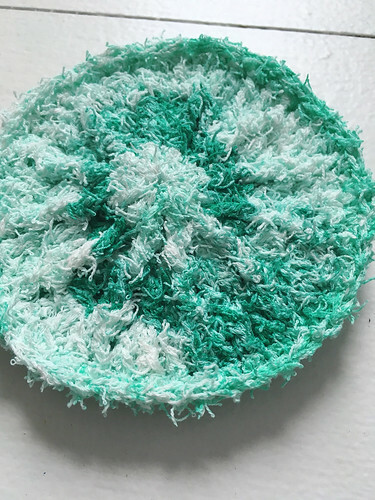 It's probably a little difficult to see because of the varying colors of mint green, but there's a textural design reminiscent of spokes on a wagon wheel, created with front post double crochets. One circle wasn't very thick, so I made a second, and single crocheted them together. 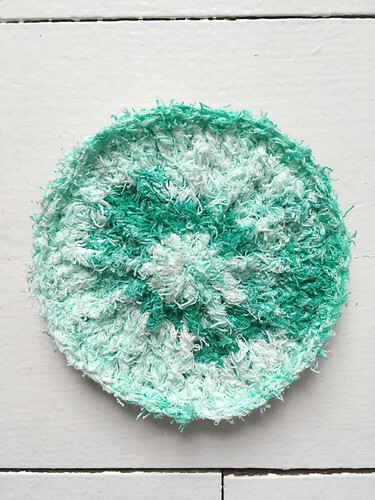 The finished dish scrubby is about 4 inches in diameter. I gave it to my mom and she said it works great. She loves how it can be thrown in the wash when it needs to be cleaned. 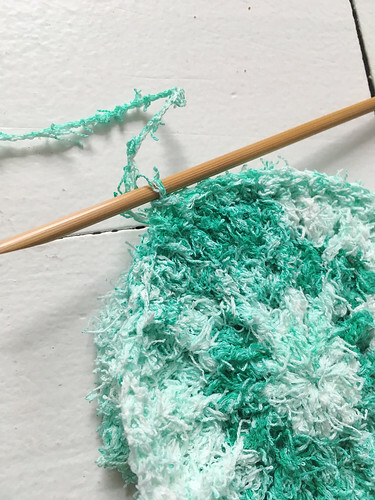 The Scrub-ology yarn is pretty cool. It's really textured, but still has some softness that doesn't make it hard on your hands to work with. The above photo shows some of that stringy texture. Front Post Double Crochet (fpdc) : yarn over, insert hook from front to back around the dc in question from previous round (hook is now positioned horizontally behind this dc), yarn over and draw through/around post of dc (3 loops on hook), yarn over and draw through 2 loops, yarn over and draw through last 2 loops. Fpdc created. Voila! Dish scrubby complete. If you try it and have any questions or find a mistake, please comment below or email me at signedwithanowl@gmail.com!